RMweb user Kevin aka Rivercider has tracked down some photos of the then-closed Ashton Gate Station site, with Ashton Meadows sidings on the BHR in the background. 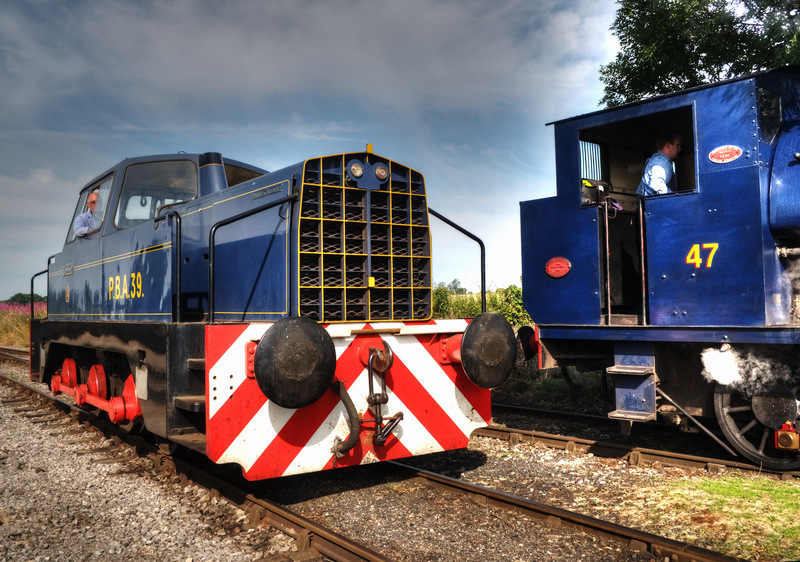 This one is from flickr user emmdee and shows an 08 shunting the yard. Flickr user Blue_Pelican_railway uploaded this one dated 1977, showing that the warehouse on the right has now had its rail connection severed. Nature is starting to take hold of the platforms. Blue_Pelican_railway also uploaded this shot from May 1984 with a Billy Graham train in the foreground, and a BR Class 37 in the yard. The engineers depot was still in use at this time. The growth of surrounding foliage in the intervening years is evident. It’s been a while since the last Throwback Thursday post, so here’s an extra special event from the BHR’s history. In 1983, for the Bristol Wine Fair, some special trains were run from Bristol Temple Meads on to the harbour line. The motive power was Stanier “Black 5′ No. 5000, part of the National Collection. It is pictured both on the BHR and at Temple Meads in company with ex-GWR ‘King George V’. I believe that, as with the coal trains, the special ran at high tide to reduce the stress on the riverbank. These pictures appear here courtesy of Paul and John Stanford, with thanks. As previously mentioned on this blog, in 1981, the Western Fuel Co.’s diesel shunter Western Pride was in need of an overhaul. This locomotive was used to shunt wagons on the dockside and into the WFC compound, as well as trip workings along the New Cut to Ashton Meadows sidings, from where a BR loco would take the wagons onto the main line. So it was that Henbury was hired as the first preserved steam loco to pull scheduled goods trains for British Railways (BR having stopped using steam traction in 1968). She crept onto the Western Fuel Co.’s site at 7am on Monday 28th September 1981 and worked for the next three weeks hauling coal trains of up to 450 tons. This cinefilm was captured by Bob Edwardes and appears here with permission. Points of particular interest include running on the main line to Bristol Bath Road engine shed to use the turntable (creating quite a contrast to the BR Blue mainline diesels at Bristol Temple Meads!) and double heading with the PBA Rolls-Royce Sentinel No. 41 (10220) that took over duties from Henbury. 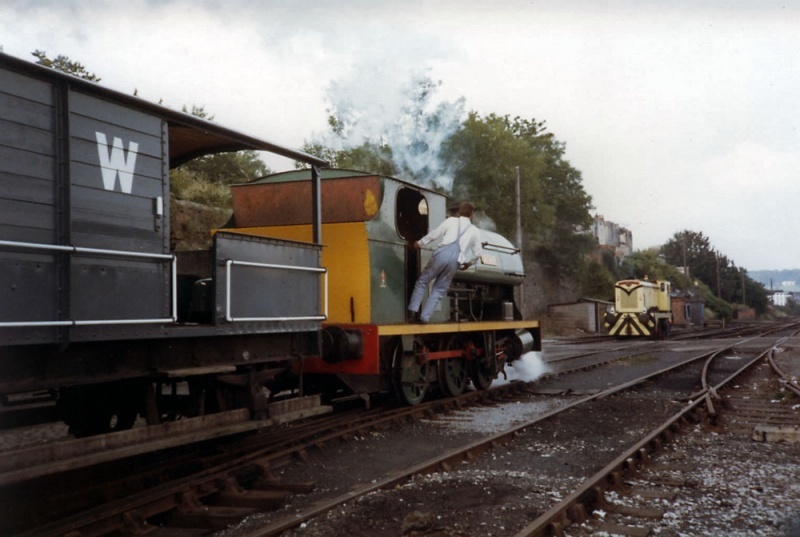 In this photo found on the Bristol Railway Archive, ‘Henbury’ complete with full yellow end and bufferbeam, meets ‘Western Pride’ on Whapping wharf circa 1981. The diesel loco is standing on what is now the long siding in the yard. This photo also illustrates the industrial backdrop of the early days of the Harbour Railway, quite a contrast to the contemporary view.